The clothes are washed and the nursery is ready, maybe the infant carseat is already securely in place. But what about your hospital bag? 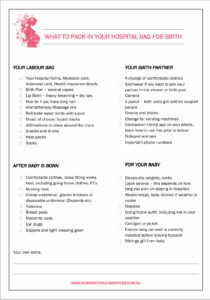 If you’re around 36 weeks pregnant and haven’t yet packed your bag, this great Hospital Bag Checklist is for you! Regardless of your chosen place of birth you’re going to need some things packed. If you’re planning a home birth it’s still a great idea to have a bag sorted for yourself and baby.